You're on the right page if you want know if you want to know whether EKSU sandwich admission form is out. You will be taken through the entry requirements, procedures of application, price and more. 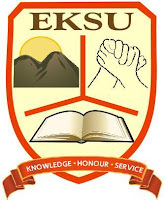 Application forms are now available for suitably qualified candidates for admission into the following Undergraduate and Postgraduate courses in the Sandwich programme of Ekiti State University. Ado-Ekiti for the 2018/2019 Contact Session. B.Ed in Adult Education with options in one of the following specialized areas: Women Education Industrial and Labour Studies, Community Development and Cooperative Management. Three (3) passes at GCE Advanced level plus credit passes in five (5) other subjects at GCE O/Level or SSCE. Nursing and Midwifery Certificate plus Post-Nursing Diploma with Credit passes in Re (5) 0/Level subjects including English Language and Mathematics at not more than two sittings is acceptable for B.Sc (Ed) Health Education. Passes in two major subjects in the NCE plus credit passes in five (5) subjects at GCE O/Level or its equivalent. A pass at the NCE General English is acceptable in lieu of credit passat the SSCE/GCE O/Level English. Passes at credit/merit level in two major subjects of the Associate Diploma in Education with GCE O/Level credit passes or its equivalent in five (5) subjects at not more than two sittings. National Diploma with credit/Merit passes in relevant subjects plus credit passes in five (5) GCE aLevel subjects at not more than two sittings. Passes at credit level in five (5) subjects including English Language and Mathematics at the GCE O/Level with any of the following is acceptable for Computer Science Education: i. Diploma in Data Processing from recognized Universities. ii. ND (Computer Science). Nursing and Midwifery Certificate together with O/Level credit passes in five (5) other subjects is acceptable for the B.Sc (Ed) in Physical and Health Education. The NABTEB credit/merit passes in five (5) subjects together with the Advanced Level NABTEB Certificate in any two (2) subjects is acceptable for the B.Sc (Ed) Technical Education. A. Passes at credit level in five (5) subjects including English Language in WASC/GCE O/Level at not more than two sittings. Five credit passes in five subjects including English Language and Mathematics in NABTEB is acceptable for the B.Sc Ed) Technical Education. Candidates with Third Class at the first degree in the Arts. Sciences or Social Sciences from an approved University are eligible for admission. HND with credit/merit passes in relevant teaching subjects. The following courses are available at the Masters Degree Level: Philosophy of Education. Guidance and Counselling. Psychology of Education. Language Education, Science Education. Curriculum and Instruction. Educational Technology. Educational Management, Social Studies Education. Tests and Measurement. Mathematics Education. Exercise Physiology. Organization and Administration of Sports. Health Education. Sociology of Education. Human Kinetics and Sports. Library Science and other courses as approved by Senate of the University. All applicants seeking admission into any of the Master's Degree and Postgraduate Diploma Programmes must have rive credit passes at O'Level in relevant subjects including English Language and Mathematics at not more than two sittings. A pass at the NCE General English is acceptable in lieu of a Credit pass at SSCE/GCE/O'Level. Upon successful transaction Print an online receipt containing the confirmation code and supply the Receipt Number and Confirmation Code in the online receipt printed to access the form. Complete the Application form online and print a copy.